If you love to sail and see yourself as a bit of a sailor but don’t want to travel out of London then look no further as London has many fun nautical opportunities that can be done throughout the year. Here are some of the nautical experiences that are in London which ‘Love Pop Ups London’ community has experienced and reviewed. Do you love boats, canals and picnics then look no further. On a GoBoat (holds 8 people) you can sail down from Paddington canals through Little Venice to Camden and back whilst enjoying a picnic on-board (if you choose) as the GoBoat has a large picnic table in the middle. All the boats are powered by electric engines. GoBoat has been designed to provide a sense of freedom, wellbeing and togetherness. Here are some quotes from some of the community members whom had the opportunity to experience GoBoat back in summer. “We sailed along the Regent’s Canal – so definitely no Locnhess type monster. If you have hired for a couple of hours, and have our boating skills, you’d be able to sail smoothly towards London Zoo and back to the GoBoat base in Merchant Square. Also, don’t worry about not having nautical skills because it’s only one way. You’ll have to remember a few general rules like keeping to the right and how to steer but it’s pretty easy. And all these are briefed by the GoBoat team before you set sail”. To read all the other community members blogs/reviews that had an experience on a GoBoat click here. Plus here is a video of one of the journeys https://youtu.be/-xhVxi92uBM. If you would love to ride on a GoBoat you need to pre-book. Click here to book. Do you love adrenaline, love tour talks, love to be like James Bond, love the London Thames then look no further as Thames Rocket provides all this. Thames Rocket is most certainly the best and most unique, stand-out activity in London to do and feel like James Bond. 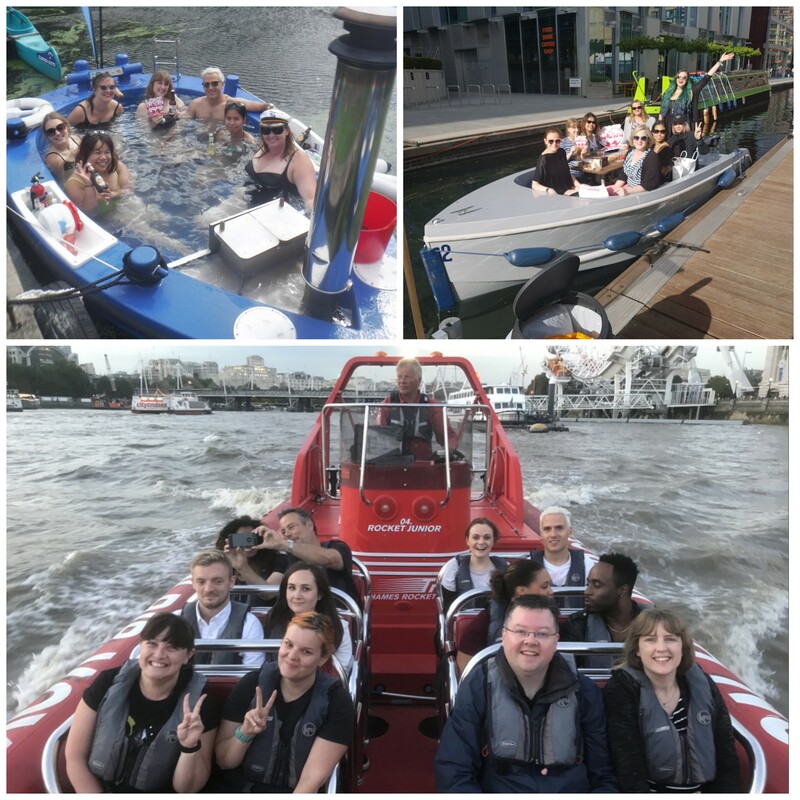 Not only will you experience speed like no other on this 12 seater rib but you will also be entertained by one of the best guides on any speedboat telling you about the many sites of London and giving you a laugh at the same time. You will see in fact over 20 iconic London landmarks and sights on your ultimate London adventure. Here are some quotes from some of the community members whom had the opportunity to experience Thames Rocket back in summer. Read all the other community members blogs/reviews that had an experience on Thames Rocket click here. Do you love hottugs, love water, love boats, love the canals of London then look no further as HotTug UK is the perfect hottug to sail down the canals on London whilst in your swimwear. You will be sitting in a HotTug with 1800 litres of warm water that is kept hot at 38 degrees Celsius 100 degrees F) via a underwater wood burning stove. The HotTug is constructed from wood and fitted with glass-fibre reinforced polyester. The stove is made of stainless steel and has a double-walled pipe. The HotTug is powered by a built-in electric motor making it very quiet and reaching a speed of 3 mph. This will certainly be the most unique 90 minute experience that you can ever have in London whilst sailing down the canals in your swimwear with friends. Here are some quotes from some of the community members whom had the opportunity to experience the HotTug back in summer. To read all the other community members blogs/reviews that had an experience in a HotTug click here. Great thing about all the nautical trips from above is that you don’t need any sailing experience as anyone can learn and sail them.